Friday September 14, 2018 - Deputy President William Ruto will be among thousands of Nairobi University students who will graduate today. The Deputy President graduated with a degree in Botany and Zoology from the institution in 1990 and a subsequent Master’s Degree in Environmental Science in 2011. 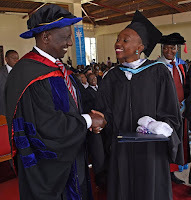 And today, Ruto will be among few Kenyans who will be honoured with a PhD. In June 2016, Ruto failed to have his thesis admitted by a team of examiners when he presented it to the School of Biological Sciences. Ruto’s thesis report was on the impact of human activities on riparian reserves at Saiwa Swamp, Trans Nzoia County. From today evening, Ruto will now be called Dr William Ruto.